Superheroes are popular and fun to read about or watch in a movie. They are given different extraordinary abilities. Some can fly. Other superheroes possess tremendous strength, wonderful eyesight, exceptional hearing, or can run faster than a train. I created a superhero and wrote three adventures about him. You can find him HERE. Most superheroes use their special ability to protect themselves and others. 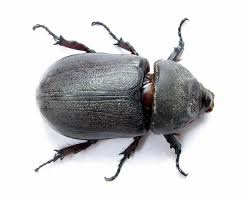 Their special ability is like invisible armor. Armor is used for protection. 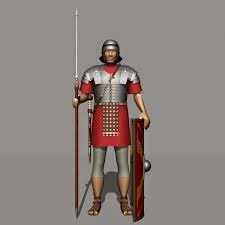 Soldiers throughout history wore armor. 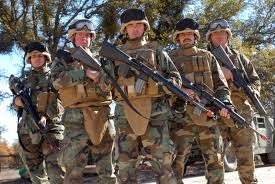 Men and women in the armed service today wear armor. 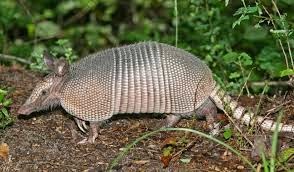 Some animals were created with armor. 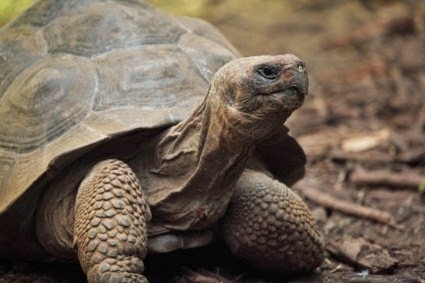 What would happen if the turtle or snail crawled out of its shell? 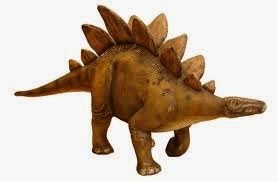 What if the stegosaurus took off its blades of armor? That’s a funny thought but if it could happen they would be hurt or even killed. Why do you think God gave them this special armor? That's right. For protection. Who else needs armor? We do. You and I need to wear our armor. Did you know the Lord gave you armor to wear? 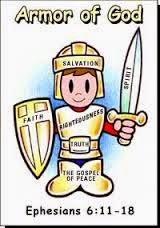 He says in His word to put on the armor of the Lord. 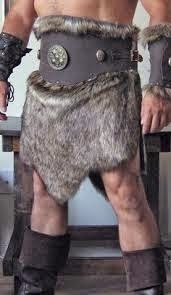 The armor includes a breast plate, belt, shoes, shield, helmet, and a sword which is an offensive weapon. This armor and weapons are special and invisible to our eyes but the devil and his bad angles can see them. This armor the Lord gave us is the most important armor there is. I bet you are wondering how to put on armor you cannot see. Well, the first thing is, you need to be a child of the King. God made you and loves you. When He made you, He gave you the ability to make decisions and choices. You can choose to do right things or wrong things. The Lord gave you the right to choose and accept Him or reject Him. Jesus Christ died for you. He paid the price for you to enter heaven when you die someday. This is not automatic. You need to choose to accept what He did for you. If you don’t accept him, you are not his child and do not receive his armor. You can read more about accepting Him as your Savior HERE. Why do we need to wear the armor the Lord gave us? The bible says we wrestle or fight against spiritual hosts of wickedness. This is talking about the devil and evil that is done by him and his army. Sometimes the devil uses people to do his mean and evil work. The devil is the enemy. We cannot see him but he is real. 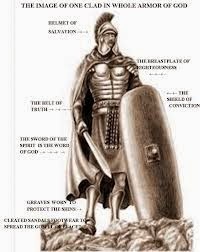 His evil intentions, schemes, and attacks can be fought off with the armor the Lord gave us. Each piece of armor has a special ability and protection for you. The first piece listed is the belt of truth. The Lord Jesus IS Truth. When you accept Him you put on Truth. 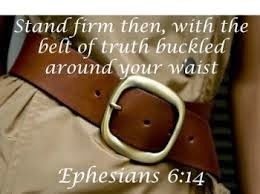 Therefore, if you are His child you already are wearing the belt of Truth. The belt of Truth or He himself is surrounding you like a bet surrounds your waist. The belt on a soldier is important for many reasons. It protects the gut—your vital organs. The belt anchors other pieces of armor on the body. The belt can hold other tools like a compass which will show you which way you are headed. Our bible, God’s word is a compass. If you read the Bible or have someone read the Bible regularly to you, it will enlighten you and show you which way you are headed and if you need to turn. In other words, if you are doing right, you will know you are headed in the right direction, but when you are doing things that are contrary to God’s word you need to stop doing those things and change directions in your life. The belt can also hold a weapon. A solder can carry a sword or dagger in a sheaf on his or her belt. Can you think of other things the belt can hold? The belt is important and reading God’s word helps us keep the belt strengthened, cleaned, polished, and ready for battle. Can you point to the Belt of Truth in the picture? I will tell you more about each piece of armor the Lord has given you in other lessons. Memorizing God's word helps us with the belt of Truth. This is a long passage that we will go over in these lessons about the armor of the Lord. Take a piece of it at a time until it is in your mind and heart.